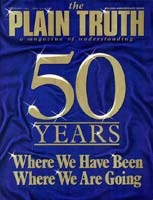 Thundering out over more than one million watts of radio power and on more than 340 television stations worldwide, Herbert W. Armstrong has authoritatively explained the meaning behind world events for more than a half century on the World Tomorrow program. The program is considered by US. media officials to be the longest continuously running radio broadcast in the United States. From state-of-the-art television and radio studios in Pasadena, California, Herbert W. Armstrong delivers weekly and daily broadcasts on the causes of today's international and domestic problems. Clockwise, at right: Mr. Armstrong offers a free subscription to The Plain Truth at the conclusion of another broadcast; an audio technician mixes a program sound track; the studio's chief engineer checks technical quality; personnel direct taping in the control room; and the telecast is electronically dubbed for worldwide distribution.